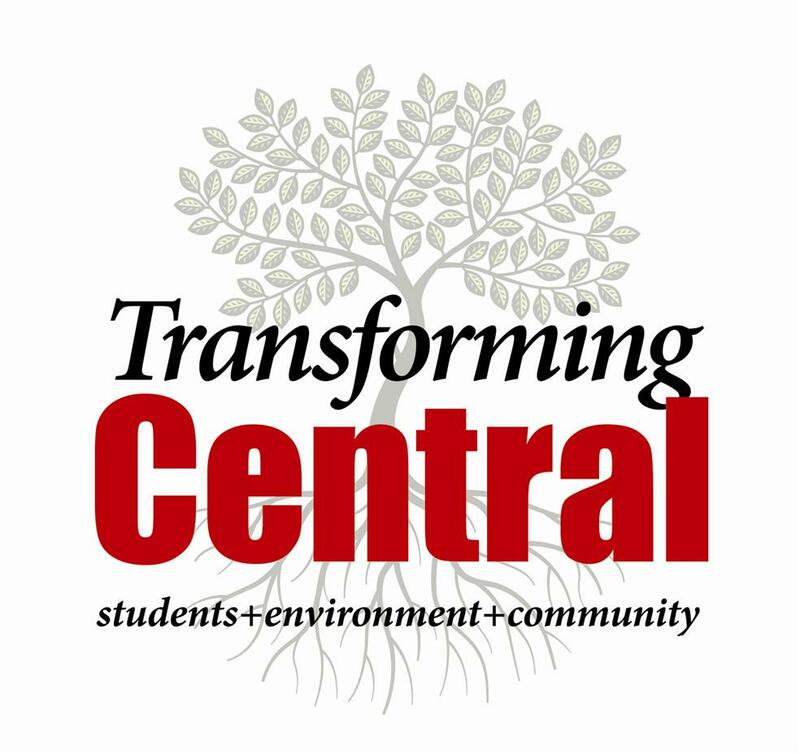 Transforming Central is a community effort to reshape the urban landscape of Central High School in order to improve the students’ daily experience, address the environmental impacts of our campus, and connect with the vibrant community that embraces the school. Thank you to everyone who came out on May 18th to celebrate Central's 150th Birthday on the new plaza. Current students as well as alumni musicians, Martin Devaney and Lucy Michelle performed outside while spectators enjoyed the Knight Foundation funded outdoor photo exhibit. Photos from the Minnesota Historical Society of Central's past are currently mounted on the building until April, 2018 alongside images taken by photographer Chris Faust . Tot Boss and The Cave food trucks will be onsite if you wish to purchase dinner. KSTP ran a quick "Minnesota Moment" segment about Central's Knight Foundation Photo Exhibit on Monday, May 1. 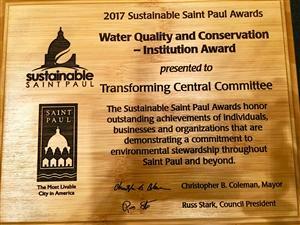 On April 19, 2017 Transforming Central received the Water Quality and Conservation Sustainable Saint Paul Award from Mayor Coleman and the Saint Paul City Council Members. On October 11, 2016, Transforming Central was awarded a $5,000 matching grant from the John S. and James L. Knight Foundation for an outdoor historical photography exhibit. Award winning photographer and former Central parent, Chris Faust has taken photos throughout the school year of students, faculty and members from the Central community. September 6 was declared "Saint Paul Central Day" by both Governor Dayton and Mayor Coleman. Lieutenant Governor Smith, Mayor Coleman, Council Member Tolbert , Principal Mackbee, and Interim Superintendent Thein spoke about Central's impact on Saint Paul history and Capitol Region Watershed District's Mark Doneux explained the environmental benefits of Central's new water filtration system. On August 3, the Saint Paul City Council passed a resolution recommending a Saint Paul Neighborhood STAR grant up to $100K for the Transforming Central project if all STAR dollars are not used for other projects or they come under budget. (Resolution #16-1299). We send thanks to the Saint Paul Neighborhood STAR Committee, Mayor Coleman's office and City Council members for believing in our project! 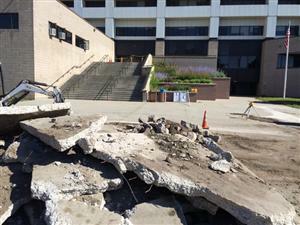 The transformation of Central's campus began on June 13th! After five years of planning, support and input from students, teachers, neighbors, alumni, funders and partners, Phase 1 of the project is complete. 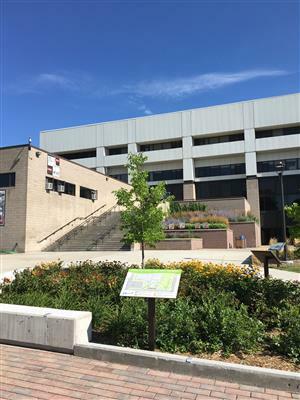 The Central sign was moved to a more prominent spot in the front plaza and incorporated into a structure with seating, lighting and perennial plants. 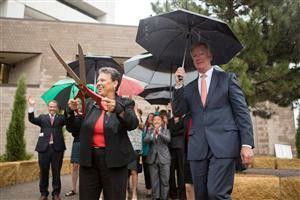 A new paved pathway was constructed across campus to Lexington Parkway. This has been most requested by the students themselves. It will be plowed in the winter and won’t be a slippery, muddy mess in the spring. A new outdoor classroom resulting from direct input from the teachers was constructed, offering space for both formal and informal gatherings of students. Thanks to the leadership of Central’s student environmental awareness group, Roots and Shoots, there are now covered bike racks in the unused alcoves in front of the building! Improved landscaping and storm water management will result in removal of the berm areas in front of the school along Marshall Avenue. When the project if finished, 1,434,000 gallons of runoff each year will filter through the ground instead of flowing untreated to the Mississippi River and 1,367 pounds of sediment will no longer erode. Additionally, 4.23 pounds of phosphorous will no longer enter the Mississippi River watershed. Dead and diseased trees in these areas will be removed, as well as a few other trees. Care has been taken to preserve every healthy tree possible and although it might look messy, there will be net gain of trees on the site by the end of the summer. 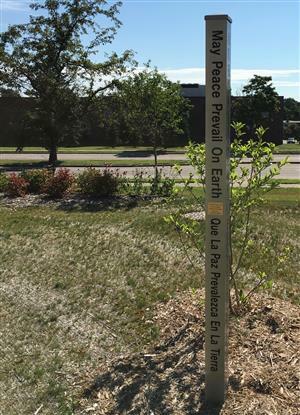 The existing memorial trees will be preserved and relocated and new dedication plaques will be installed. All of the new plantings will be native and hardy perennials, trees and shrubs and will include many pollinators. 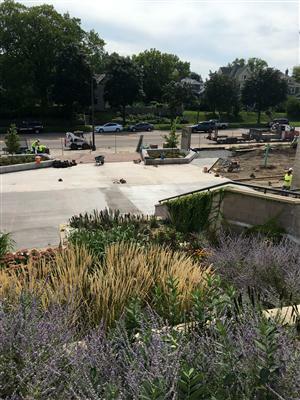 Permeable pavers were installed on the front plaza and new planters with seating were also built. 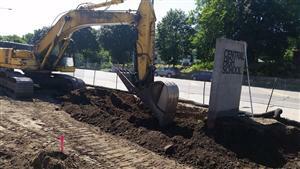 A large rain garden was installed at the corner of Lexington and Marshall. Banners celebrating Central’s 150th anniversary were installed on the light posts in front of the school on Marshall Avenue, allowing our community to share the pride and celebration of this milestone. Sharing the historic nature of the school is one of the ways the Transforming Central project hopes to build connections and pride in the community, but a complete historic narrative was needed. 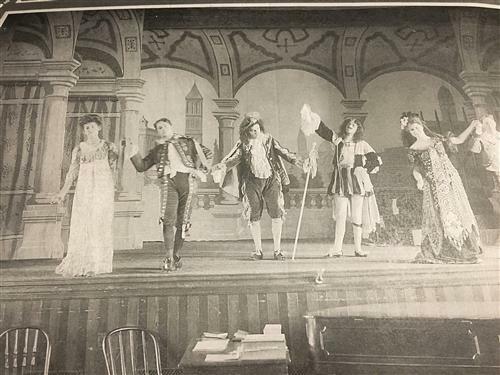 A History Project subcommittee was formed and with the help of a Legacy Grant from the Minnesota Historical Society, Bluestem Heritage Group was hired to write a 20-40 page narrative of the school. Finding an abundance of historical documents and sources, the work has grown to much more, a full and rich document with surprises and insight. 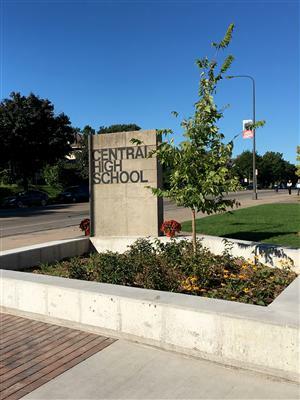 No other high school in the state of Minnesota has the comprehensive, documented and successful 150 year history of St. Paul Central High School. We will now begin to make plans and seek funding for a historical exhibit, installation, or other interpretive piece. At this key time parents, staff and alumni are invited to get involved in the history project. Printed copies will be sold at special events throughout the year. If you are interested in a copy please email us at transformingcentral@gmail.com. The Pioneer Press and Star Tribune have published positive articles about the Transforming Central Project. Environmental Science teacher Ms. Houdek and Biology teacher Mr. Skinner applied for and received an educator's grant from Capitol Region Watershed District! They received a $42,000 grant that will allow them to purchase curriculum and measurement tools like: an in-situ level logger, access ports and pump for the subsurface rainwater basin, three educational signage installations, two sampling kits for multiple water analyses, and some educational diagrams for use in the classroom among other excting equipment. Congratulations Ms Houdek and Mr Skinner! Transforming Central day at the new Whole Foods Saint Paul was March 20th. 1% of all purchases made at the new store were donated to Transforming Central. The total was $1790.66. $763,354.00 has already been secured through grants and individual donations since the start of this project in 2011! This project has been awarded $385,000 in grants from the Capitol Region Watershed District and the Minnesota Board of Water and Soil Resources for on-site storm water management to improve water quality to the Mississippi River. Almost all of this money will be used for improvements underground. 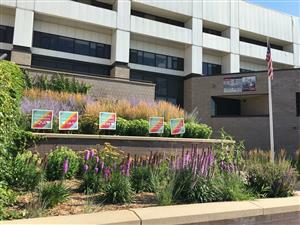 While students will use related data collecting equipment in science and math classes, these funds will have little impact on the visual components that will enhance Central’s urban landscape and the day to day use of the site. We’ll keep you updated on the progress here and Facebook. Onward, Central! The Transforming Central Team wishes to thank each and every person who has donated at a house party, through GiveMN or generosity.com, at our Benefit Concert or via the Villager insert direct request. The Richard M. Schulze Family Foundation awarded Transforming Central a $25,000 matching grant in October, 2015. We were successful through direct donations and grants at achieving our match! Mr. Schulze is a Central High alum as well as the founder and chairman emeritus of Best Buy Co. Inc. 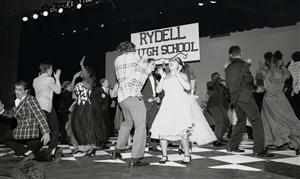 Transforming Central hosted a benefit concert and silent auction featuring current and former Central High musicians. Over $9,000 was raised that night! Local musicians and Central Alums Sean McPherson and DeVon Gray were joined by Linnea Mohn to headline the evening's entertainment. The student musicians and spoken word artists that wowed the audience included: The Cymbalix, The Loose Ends, Amani Ward and Gabby Z, as well as Kaaha Nasteexo and Armand McCoy. The Villager Newspaper Update and Donation Insert Thank you to Amidon Graphics and The Villager Newspaper for helping us get the word out about our project to the larger Saint Paul Community. 40,000 copies of the Villager were distributed throughout the city with our informational insert. Amidon Graphics donated the printed flyers and the Villager Newspaper inserted them for free. To date we have received over to $5,000 from Villager readers. Thank you to each and every one of you who donated during this time. The annual spring clean up was held in May. 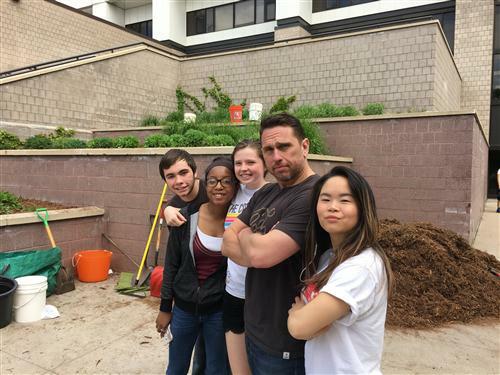 Thank you to the garden and tiered bed clean up crew that included Mr. Modelli's first and second hour Environmental Science classes. The tiered beds were weeded and mulched and the Central sign got a few petunias in preparation for summer. Thank you Nina Tuttle for leading these garden efforts. Mail: Checks can be written to: Transforming Central, PO Box 40123 St. Paul MN 55104. Transforming Central received grants from the Saint Paul Sunrise Rotary Club, Pheasants Forever and the Gordon and Jeanne Shepard Foundation. In September 2015, we applied for grants from the Minnesota Historical Society as well as the Mardag, Bigelow and Saint Paul Foundations. We continue to search for more grant opportunities. Over half of the $862,000 project budget has been raised through last winter’s grants from the Capitol Region Watershed District ($150,000) and Minnesota Board of Water and Soil Resources (175,000). These grants will allow Capitol Region Watershed District to partner with St. Paul Public Schools to implement a variety of “best management practices” at Central that will improve the quality of the storm water discharged to the Mississippi River. This will reduce sediment by 86% and total phosphorus by 90% over the target area annually. Additionally, 95% of the storm water volume generated in the project area during a one-inch storm will be treated through infiltration. 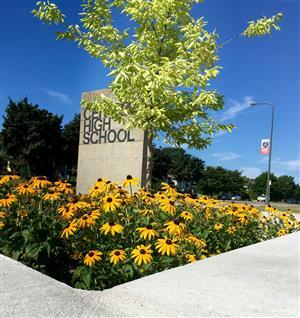 During the summer of 2012 students and parent volunteers planted the three large tiers that frame the front exterior stairway with native perennials and grasses thanks to private donations and school support. In November of 2012, Central was awarded $10,323 ($12,075 w/ Survey) in services from the Capitol Region Watershed District (CRWD) to analyze storm water runoff. This resulted in a conceptual design for improving aesthetics and solving environmental issues. A new fence was installed in August, 2013 along Lexington Parkway and Concordia Avenue thanks to the efforts of the Lex-Ham Community Council's Margaret Jones and TC member Patricia Eaves who secured a STAR grant from the City of Saint Paul. The STAR grant funds were matched by an anonymous donor from the neighborhood as well as contributions from Central students. In September of 2013 The Capitol Region Watershed District (CRWD) awarded $50,000 to Central High School for the storm water retrofit project. The Transforming Central project got underway by a dedicated group of parents, students and community members in the fall of 2011. In the fall of 2011, we partnered with student groups Root and Shoots and the National Honor Society to plant over 500 bulbs on the school grounds. We surveyed students, faculty, administrators, parents and community members to gather input on desirable exterior improvements. The survey results were incorporated into set of designs by The Metropolitan Design Center from the College of Art Design at the University of Minnesota. They analyzed Central’s site and looked at the functionality of the grounds, student use and perceptions as well as overall environmental concerns. At the completion of the year, the Metropolitan Design Council created the following document: Central High School: Transforming the Character of Place. This document and subsequent discussions have been instrumental in moving our vision forward. Awards – On October 27, 2014, the Lex-Ham Community Council awarded Transforming Central “The Good Neighbor Award” for its role in supporting the neighborhood as a great place to live.